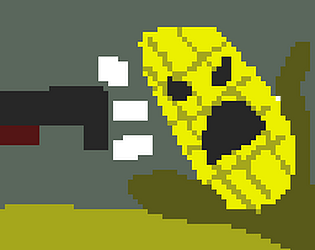 I liked the main character and was able to figure out that it was corn. For some reason the enemy would spawn behind me and I could not win, unless I can walk through the corn before they are red. Overall there seemed there was no objective. Unfortunately, a ligma-ridden corn won't save this game. The game is buggy and not that much fun. For what it's worth, it has no text and is relevant to the theme, so you get points for that. I think the game play is the bit that needs the most work. I think this game needs to be faster. As it it, the corn spawn way too slowly and the game gets boring quickly. Sound effects aren't essential, but would really make shooting feel more impactful and fun. Some goal for the player is also needed; as it is, there is no reason to play on.